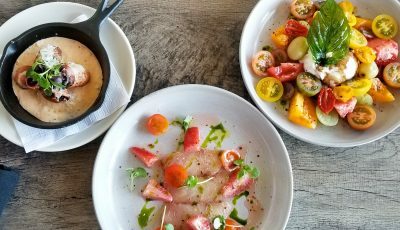 Several new restaurants have opened recently on Balboa Island, but there’s one familiar Island bistro that’s celebrating its 20-year anniversary: Basilic. 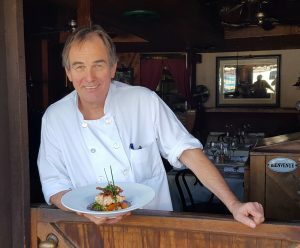 Swiss native Bernard Althaus founded the 24-seat Basilic Restaurant (named after Bernard’s favorite herb) in 1997, and it’s remained popular for two decades thanks to a classic Swiss-French menu and the hospitality of Bernard and his wife, Arlette. 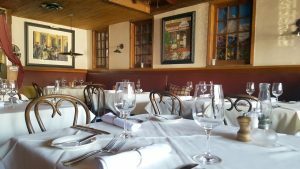 The restaurant has become synonymous with fine dining on Balboa Island, and is a landmark destination for the island’s locals and visitors. It’s also a family affair—Bernard’s wife is often there greeting customers, and his daughter helps out. The Basilic menu has changed a bit over the years, but many dishes have become so popular they’ve stayed on. 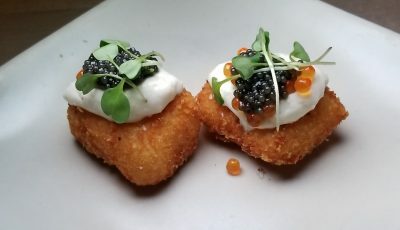 “People get used to one dish so they come back for it,” noted Bernard, who said he makes seasonal menu changes depending on what ingredients become available. He also brought back some old favorites as nightly specials, and is still hosting his ever-popular monthly raclette night, featuring all-you-can-eat raclette (melted cheese) served with fingerling potatoes and cornichons for $25.50. 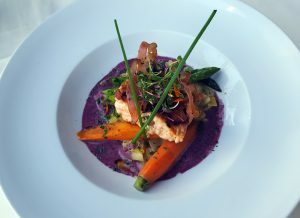 For more information, visit basilicrestaurant.com. 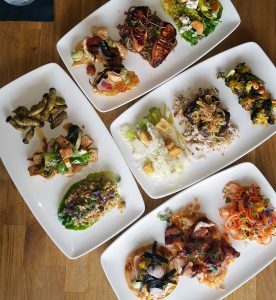 He’s been garnering rave reviews and awesome accolades from critics and customers, so you’d think Chef Ross Pangilinan of Mix Mix Kitchen Bar might start to ease back on his rigid restaurant schedule (he’s usually in the kitchen preparing cuisine and garnishing plates), but no, he’s busier than ever. After adding Sunday brunch, Chef Ross is now open for lunch Tuesday through Friday, but it’s not your typical lunch menu. 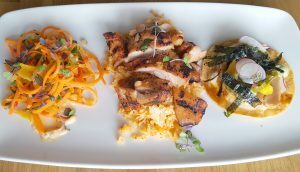 Chef Ross is offering a $15, three-course bento box lunch featuring favorites from his globally inspired menu, including Pork Cheek Adobo and House Made Chitarra “Carbonara” Pasta. During lunch, which runs from 11:30 a.m. to 2 p.m., diners now have the luxury of creating their own modern bento box. The modern bento box is also available for take-out and features one salad, one snack, and one main. For more information, visit MixMixKitchenBar.com. 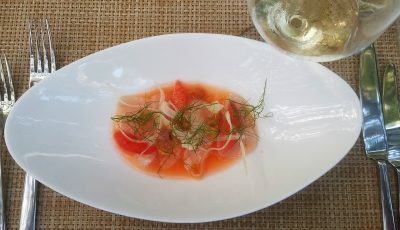 Franco and Donatella Barone are plenty busy these days—they took over the kitchen at Ti Amo restaurant in south Laguna Beach, and they’re moving their flagship Il Barone restaurant to a new location on Bristol Street in Newport Beach. Now, they’ve opened Il Barone Sicilian Street Food in Pacific City, the popular food and boutique mall on Coast Highway in Huntington Beach. Their oldest son, Jonathan, is running the Pacific City location. It’s a casual spot serving whole pizzas or by the slice, to eat on-site or to go. 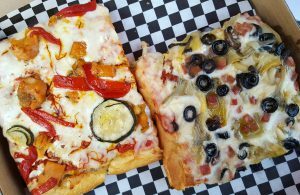 Christopher popped over to Il Barone Sicilian Street Food and grabbed two slices of deep dish pizza to go. 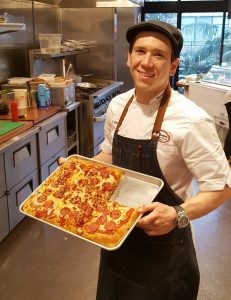 He learned from Jonathan that the pizza was made using focaccia bread, which explained why it was so thick and delicious. The menu includes some pasta dishes, salads and desserts. They are open late on the weekends—a perfect spot for those late-night cravings. For more information, visit gopacificcity.com/il-barone.